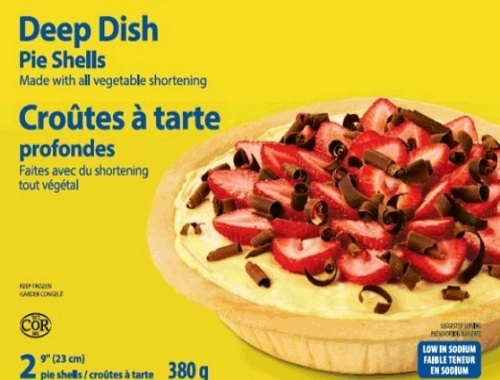 The Canadian Food Inspection Agency has updated a food recall warning for various brands of pie and tart shells recalled due to E.Coli! Harlan Bakeries - Edmonton is recalling various brands of pie and tart shells due to possible E. coli O121 contamination. Consumers should not consume the recalled products described below. No Name brand Deep Dish Pie Shells, Sweetened Tart shells and Tart Shells. Great Value Deep Dish Pie Shells, Tart Shells. Apple Valley 2" Sweet Tart Shells, 3" Tart Shells. There have been reported illnesses associated with flour; however, at this time, there have been no confirmed illnesses associated with the products identified in this Food Recall Warning. Click here for info about this recall.